Learn how to customize your GetSwift account with your logo and setup your dispatch settings. To add a user (dispatcher) to your account so they can also login and manage your operation is really easy! 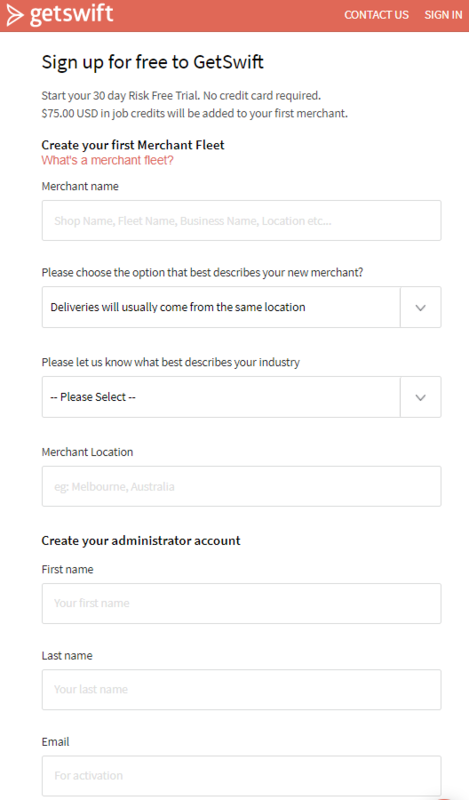 Use the same email address used when creating your merchant account when using a driver account. Enter the driver’s email address which sends them an invitation via email to register. Enter all driver details manually and complete registration on behalf of your driver. Use your unique registration link that you can share with drivers through social media or job postings, etc. 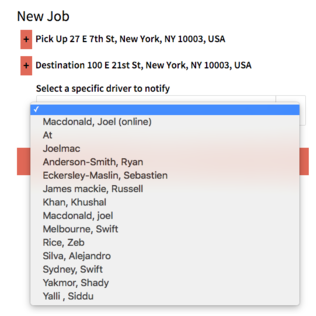 There are 9 ways to enter jobs into GetSwift, both automatically or manually. Includes data fields for timing / scheduling, delivery instructions, items, fees, etc. Through our integration with Zapier, we also have connections to 1000+ different apps including Shopify, WooCommerce, Wordpress, Jotform, Typeform, Google Sheets & Forms, Acuity Scheduling, Calendly, Hubspot, Paypal, Stripe, Square, etc. You can select which method you would like to use in Settings → New job driver notification method. For advanced capabilities with this notification method, check out Driver Match Key to see how you can use this to automatically assign drivers. Configure when the messages get sent, what the messages says and the type of communication medium you want the message to be delivered. Enter a single job with expanded details - including data fields for timing / scheduling, delivery instructions, items, fees, etc. Estimated Time of Arrival. This can be viewed on your map as well as be sent directly to your end customers by enabling alerts. In the Driver App, your driver has the option to add a photo and/or signature as a proof of delivery. Enabling this feature makes it mandatory for your drivers to collect POD. This can also be sent to your customer upon completion of the job. Sets the default delivery fee in the ‘add a task’ form. If using you are using templates to enter tasks into GetSwift, this will only autofill new templates. Sets whether the driver can record when they are at the pickup location in the Driver mobile app. This is used for record-keeping purposes only. Sets whether the driver can record when they are at the drop-off location in the Driver mobile app. This is used for record-keeping purposes only. Sets whether or not drivers will be automatically assigned to all tasks that they have been notified for. Drivers will not have an option to accept or decline tasks. Sets how far in advance of the pickup time you would like task notifications to go out to drivers. Depending on your business model, you may want to notify your drivers days or weeks before these future tasks. For example, if you want drivers to be notified 2 weeks before pickup time, you can enter 20160 minutes. Sets the amount of time before late tasks (that have not been accepted by any drivers) are automatically cancelled. Note, this setting is in hours, not in minutes. Sets the default percentage of delivery fee paid to the drive. If using you are using templates to enter tasks into GetSwift, this will only autofill new templates. This only applies to commission-based drivers and is used only for record-keeping purposes. Sets whether the collected signature or photo (proof of delivery) will be attached to completion email sent to the end customer. The emails can be set up in Alerts. Sets the language and location for the GetSwift web application. This will affect language of the interface and also affect specific location or cultural settings. high five: you've completed your quickstart guide!